Features: the front panel of all cabinets drop forward to allow access to the radiator inside – this makes adjusting the temperature switch, cleaning and hoovering, or hanging items from the radiator cabinet easy! All our Radiator Cabinets are designed to maximise air flow- we leave space between the radiator cabinet and the gables of the unit so that heat can move freely. An extra special addition is to add a bookcase to the top of the Radiator Cabinet. All of our quality Radiator Cabinets come in a variety of finishes including oak, walnut, cherry, mahogany and painted options such as ivory, magnolia and white. We can fit the cabinet tight to the wall, with a cut out in the base to allow the cabinet to slide over the skirting board – it looks tidy and blends into your home! Uses: Finding the perfect piece to furnish the space of your choice can often be a chore – conventional console/hall tables are often too large (or too small). 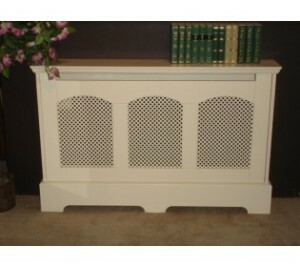 Other sideboards and bookcases will look out of place in front of radiators or protrude too far into the hallway. Enter the radiator cabinet! Not only do they look stunning but they are practical too – it’s great to have somewhere to pop your keys after a long day in the office! Here we are showing the beautiful Cromwell Radiator Cabinet. As mentioned above, the radiator cabinet can also be used as the base for a bookcase, as a display shelf in a small bedroom or to furnish and enhance any room in the house. For trade contract enquiries please get in touch with us on this site.